The variability of Cuora trifasciata sensu lato is analyzed. 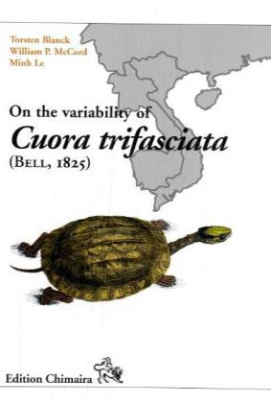 The data clearly indicate that geographic isolation has resulted in distinct populations within this species, leading to the description here of the genetically and morphologically distinct species Cuora cyclornata sp. nov., found from south-central Vietnam to western Guangxi Province, China and its subspecies Cuora cyclornata meieri ssp. nov. restricted to northern Vietnam and western Guangxi Province, China.§The holotype of Cuora trifasciata sensu stricto is herein identified, redescribed and genetically assigned to its locality of origin. Other genetically and morphologically distinct forms are discussed but for lack of sufficient data are not taxonomically described here. An overview of the literature, distribution, habitat and vulnerability of Cuora trifasciata and Cuora cyclornata are given.